When you’re a patient at Novick Orthodontics, everything we do is focused on you. Your comfort, needs, and smile goals are our top priorities. We actively listen, offer support and encouragement, and engage with our patients. They are important to us as individuals; you’re important to us, too. You’ll never feel like a number on a chart during your visits. Not only will we remember your name, but Dr. Darshana Novick and our team will remember details of our last conversation with you. One of the best things about working in orthodontics is building lasting relationships while creating beautiful, lasting smiles. We’d love to get to know you while helping you achieve the smile of your dreams! Orthodontic care is a journey. It’s one in which you start feeling uncomfortable with your appearance, perhaps ashamed of your crooked teeth; maybe you feel uncomfortable in social situations, and afraid of what people might think. As your teeth start to shift gently into proper alignment, and you see the changes in your smile, your self-esteem begins to blossom. You’re more comfortable talking and smiling with new people, and you make eye contact and walk straighter. By the time treatment is finished, you’ve transformed: Your smile is healthy and beautiful, and you know it looks incredible. You’re filled with confidence and laugh freely and happily. Best of all, this new smile is one you’ll love for years to come. We’ll be by your side throughout your journey. We’ll support and encourage you. We’ll teach you about your oral health so you can take care of your finished smile. And we’ll become your friends. We’ve designed an orthodontic practice where everything revolves around you. From an iPad station, TVs with movies or Discovery Channel videos, and free WiFi, to memory foam in our treatment chairs and heated floors, it’s all about your comfort. Our practice is equipped with advanced orthodontic technology and equipment for the most accurate diagnostics and imaging. Dr. Novick uses the strongest, leading-edge treatments, which provide the most comfortable care and give you the best finished smile. We offer complimentary orthodontic consultations at our River Forest, IL office. Come in, meet Dr. Novick and our team, and receive a free exam. Talk with us about your smile goals and let us create a custom care plan designed specifically for you. We’ll review the plan, and explain what’s involved and the available options, so you can make an educated decision about your treatment. 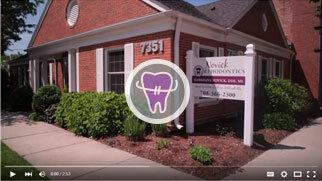 Dr. Novick and the Novick Orthodontics team look forward to welcoming you to our practice. We can’t wait to start you on the path to a lifetime of amazing smiles. Call and schedule your consultation today!